Sketchy Science: Tracking Time: How Do Scientists Know How Old Stuff Is? Tracking Time: How Do Scientists Know How Old Stuff Is? Happy New Year readers, and welcome to 2014! We hope you enjoyed your holidays! 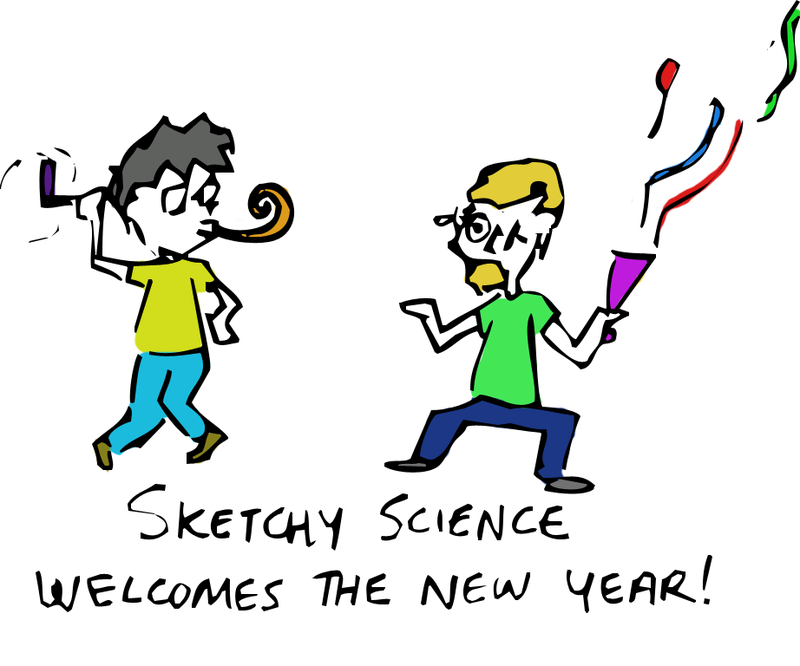 New years is an interesting concept. Obviously it makes sense to mark a starting and finishing point for each year if for no other reason than to keep things organized. You want to be able to look back at events in your life and say with certainty that they happened a given length of time ago, and years are a pretty handy tool for describing and keeping track of the passage of time. Scientists also value the ability to talk about the past in terms of years, but for a long time they were unable to make the same confident conclusions that a person can make about their own life. When you are studying the length of time it took some species to evolve, or trying to decide if one dinosaur bone is older than another it can be a difficult task to know the very basics of what you are talking about. People have spent a lot of mental energy developing ways to date things and over time we have pushed our view on the past further and further back, closer to the dawn of time. One of the oldest methods that people have used to talk about the age of things is a practice called dendochronology. Imagine you chop down a tree and want to know how old it is. Most people know that all you need to do to find out the answer is count the tree’s rings. One new ring is laid down each year, so it is easy to say that a tree you cut down today with 50 rings started growing in 1964. What most people would never think is that you can use the same strategy to talk about the age of old wooden furniture, buildings, and even the end of the last ice age. It works by looking at trees with lifespans that overlap in time and comparing them to one another. 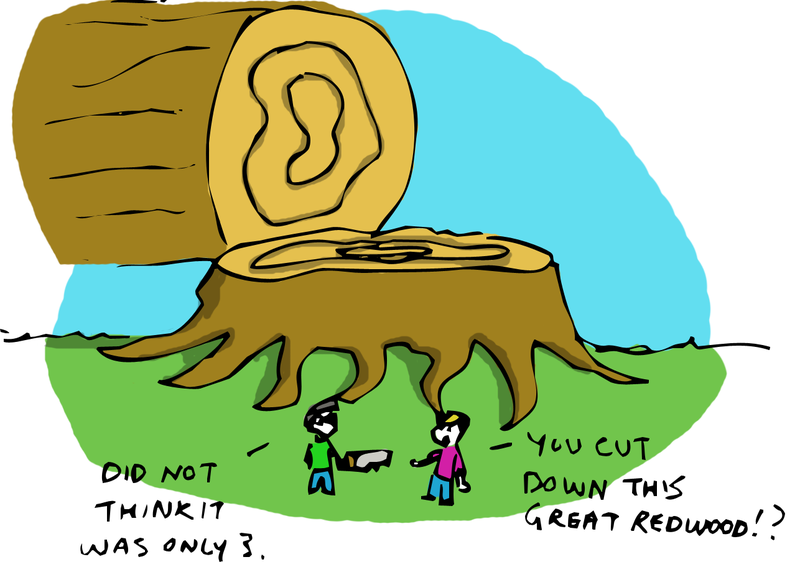 The nice thing about tree rings is that they are not uniform in size. In wet years, when conditions are good, a tree might grow a lot and lay down a thick ring. In dry years, the rings tend to be narrower. By comparing the pattern of thick and thin rings on two trees that lived at the same time you can create a window further back into the past. If we found a tree with growth rings similar to the first ten from our 50-year-old tree on the outer edge of its trunk, we could say that the new tree died in 1964 and we could count its rings back to determine when it started growing. Scientists are shockingly good at this sort of thing and have dendochronological dates going back over 11,000 years. But what do you do if the thing you are studying isn’t made of wood? We have all heard reports about a dinosaur bone being this many millions of years old, or a mammoth tusk being this many thousand, but how do scientists actually know how old that stuff is? It turns out the answer is atomic. As we learned in our discussion of radioactivity, some atoms have unstable isotope forms. What I didn’t tell you was that those unstable isotopes decay at predictable rates from one type of atom into another. 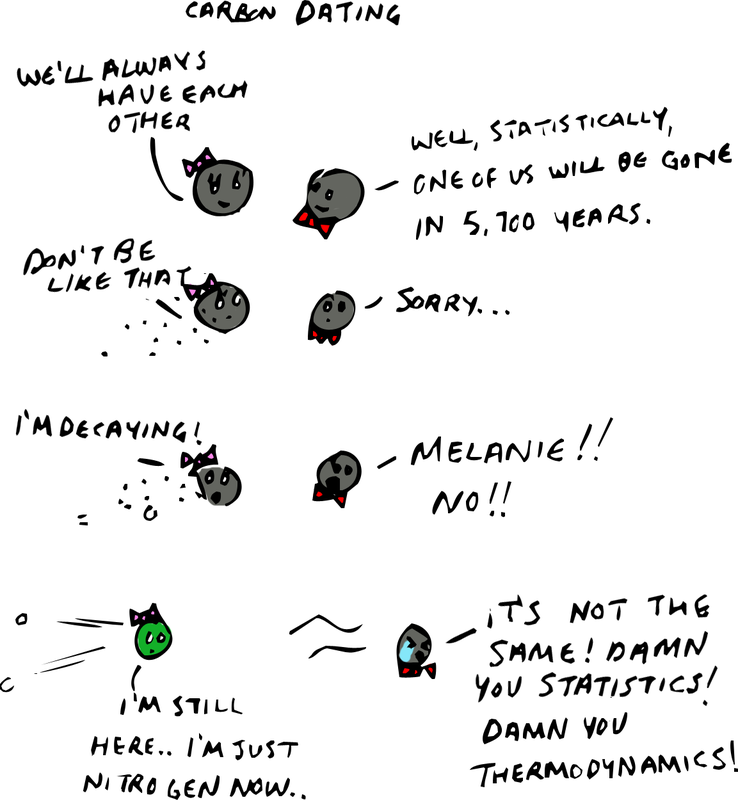 For example, if you have a sample of carbon-14 (a carbon atom with 14 neutrons instead of the usual 12) you can be sure that half of that sample will decay every 5,700 years. This is called the half-life of the sample. The handy fact about carbon-14 is that it stops accumulating in an organisms body the moment it dies. By measuring the ratio of carbon-14 left in a sample of organic matter (hair, flesh, bone) compared to the stable non-decaying carbon-12, you can know the date of something up to 50,000 years old. If you want to go even further back into the past you can do basically the same thing with different unstable elements found in rocks. Uranium-235 and Uranium-238 have half-lives of 704 million years and 4.5 billion years respectively, so they can tell you about the age of dinosaur fossils and of the Earth itself. If Uranium isn’t your thing, Thorum-232 has a half life of 14 billion years. 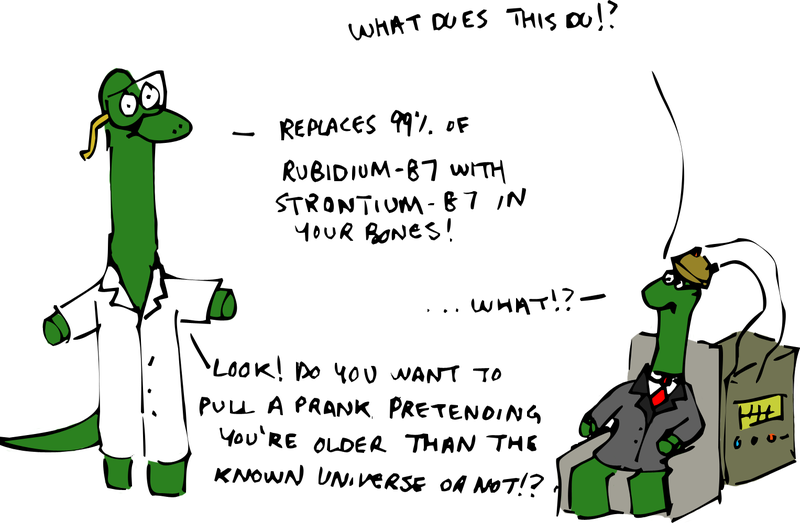 And (for the scientist who likes to keep things just slightly ridiculous) Rubidium-87 has a half-life of 49 billion years, so you have plenty of choices. It is nice to know that if we ever stop keeping track of New Years, we will have options for figuring out how old things are. A little dendochronology for things of the scale of human lives, some radio-carbon dating for items in human history, and uranium has us covered if things get really out of hand. It may seem complicated, but the ability to determine the age of things is one of the greatest achievements in all of science. This blog is giving us the view about the science and scientists that how they work for their achievements and goals. 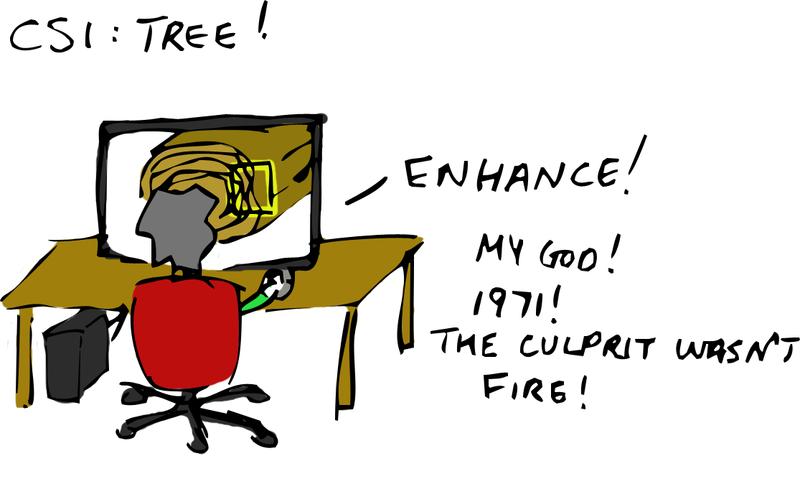 This can be a helping proceedure for the what are the best essay writing sites developers as well. We can say this is really a best and creative bog by all means.